Apples are planted in holes that are 60cm wide and 60 cm deep spaced at 3m by 3m for better growth. In each hole, 30kg of fully decomposed manure is mixed with the top soil. Top-dressing is done six months after planting with 150g of organic fertilizer to boost growth. It is necessary to avoid shedding of the young tree, however low growing crops like legumes can be planted in between apple plants. Formative pruning should be done in the first two to three years to establish the tree structure. The young nursery seedling is nipped to about 1m from the ground to stimulate side branching below the head. From the emerging branches, farmer should select three to four strong branches distributed evenly along and around the central leader and at least 15 cm apart along the trunk. The selected branches are tipped off towards the end of the growing season or during the dormant period to stimulate secondary branching. 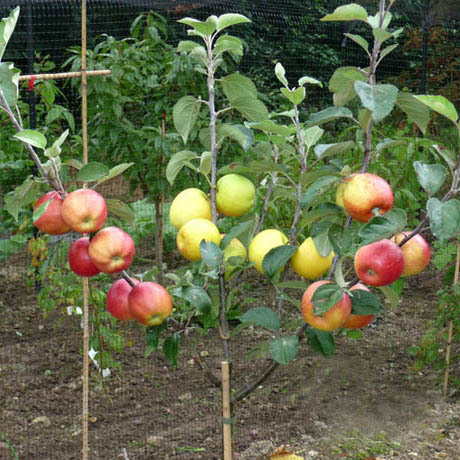 Can I plant all your apple varieties in one plot,say,3 trees of each? yes Emily you can do that. How feasible is it to plant apples in Oloitokitok? Do u have varieties suitable for Makueni?